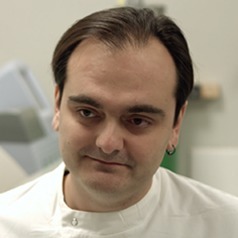 Sterghios A. Moschos is an RNA biologist with a specific interest in Personalised Medicine and Gene Therapy. His work explores innovative ways by which RNA and big data can be used to better understand disease, measure with high accuracy and precision what happens to the patient, and use systems approaches to intervene optimally, eliminating the cause of disease where possible. To meet these challenges, work in the Moschos lab is equally divided between bioanalytical innovation and overcoming the greatest bottleneck in molecular therapy with nucleic acid drugs: delivery. This is achieved by training multidisciplinary scientists on cutting-edge biomedicine that integrates the latest computational, engineering and biotechnological advances in their work. The goal of his team is to perform industrial-grade orthogonal research, delivering highly reliable basic and applied outputs that transform the field, enable leap advances in diagnostics and therapeutics research, and ultimately revolutionise healthcare provision.